We are involved in the manufacturing and trading of a premium quality Colored Gel Paper. Used for gift box packing and metope adornment, it is highly popular among the vast client-base we have accomplished to acquire. 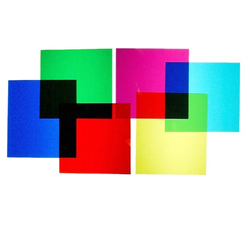 The whole range of the colored gel papers offered by us is highly regarded for its softness and flexibility. To meet the rising demands of our customers, we come with high quality Colored Gel Paper for Par Cans. Extensively used for covering lights, it is highly popular. Known for its tearing strength, the offered product is highly acclaimed among our customers. To cater to the varied requirements and demands of our clients we make the offered range of gel papers available in different colors. Looking for Colored Gel Paper for Par Cans ?